Eva Dobbs is separated from her husband, Cooper. She keeps getting roses sent to her from a secret admirer and to make matters worse, Cooper is back in town and wants to see her. Now, memories are brought back to life of a love they once had together at the mere sight of one red rose. 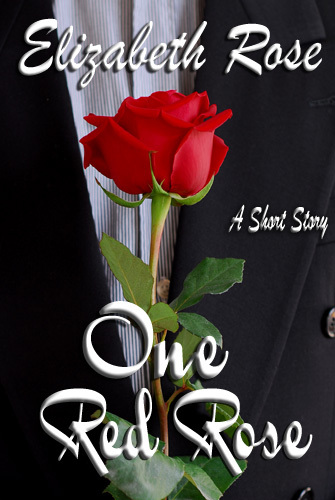 Click icon to get short story e-book One Red Rose for only .99 cents! One red rose and her heart stood still. Eva Dobbs blinked once, then twice, bewildered at the flower lying precariously atop her desk. She closed the door behind her softly, and made her way across the floor of the Tyme Travel Agency where she’d worked since her twins, John and Julie went away to college. She reached out cautiously, fingers stretching to pick up the icon of love, but pulled away before she’d touched it. It wasn’t the first red rose she’d ever received. But it was the first in a very long time. “Carol?” she called to her coworker, typing at the desk behind her. “Yes, Eva?” the plump woman asked, without looking up. The keys clicked away at a 120 words per minute. Eva never could understand how a woman over sixty could move so fast. Carol was a good twenty years older than herself, and yet the woman never seemed to tire. Eva stood stiff and still, the memory of a happy time in her life brought to the surface by the sight of a mere red rose. Times long ago forgotten of a foolish young couple so much in love they’d eloped at the mere age of eighteen. It’s not that she wasn’t happy being married to her high school sweetheart, Cooper Dobbs for close to twenty-five years now, but things changed. Complacency beguiles one’s need for romance after so long. They hadn’t thought they really needed the touch of intimacy, but truth won out in the end. It was one year ago today they’d separated. One long year of emptiness in her soul, wishing for those high school years where romance was all that mattered. “How what got there, honey?” Carol typed off another fifty words before Eva was able to actually reach out and touch the precious flower. Being careful of the thorns, she pushed back the green tissue wrapping and gently lifted the rose in her fingertips, holding it up for Carol to see. “Hmmm?” Carol stopped her typing and looked over. “Oh, that!” she said, bright and cheery. “A delivery man dropped it off about an hour ago.” She picked up her mug of coffee and brought it to her mouth. “Well, whose is it?” Eva asked carefully, thinking they’d been using her desk again for drop-offs and deliveries. She’d really have to make it clear that just because her desk was nearest to the door, it didn’t mean everything got dumped there. Carol just about burned her mouth on her coffee and decided to blow on it instead. Eva pondered the thought and looked around the room. Her boss, Chadwick Tyme was a man in his fifties who had an office in the back. The only other person working there besides Carol and herself was Carol’s grandson, Leif, who’d just graduated high school and cleaned the office and refilled supplies. She looked over to him, surveying his spiked hair, black clothes and black painted nails, and decided right then and there he wasn’t the kind of guy who would have girls sending him flowers. “Did you say this was delivered to me?” she asked, still not believing it. “Card?” Eva reached down inside the wrapper and brought forth a small white envelope. Putting the rose down on the desk she used both her trembling hands to open it. Eva, it read. You are in my heart. Love, your secret admirer. Who’s it from?” asked Carol, putting down her coffee and looking over. “Date?” Eva dropped her purse to the floor and slid into her chair. She hadn’t thought about dating anyone since she and Cooper split up. After all, they were still legally married. Startled, Carol spilled her coffee on the top of her desk. She grabbed at the tissue box to mop it up. “Romance,” Eva repeated the word, turning slowly in her chair. Yes, there had been something missing in her life, and she wondered if Carol was right. Was the missing romance in their relationship what caused them to lose interest in each other and finally split up? She picked up the rose and ran a soft petal across her cheek, her eyes squeezing closed in the process. If only she had thought of this years ago. Maybe things would be different now, if she had. Maybe Cooper would still be in her life. And maybe their splitting up wouldn’t still be so hard to handle. She wiped the tear from her eye and tried to put the thought from her mind. How could one red rose bring all these emotions to the surface? The phone on her desk rang, and she jumped in surprise. Rose still in hand, she picked up the receiver with the other. Her hand squeezed around the stem of the rose, pricking her fingers with the thorns in the process. Her heart beat rapidly, and her mouth went dry. He hadn’t contacted her once in the year after he’d moved from their hometown of Joliet, Illinois to Gary, Indiana. Why was he calling her now? Heart lodged in her throat, she didn’t know what to say. When they’d parted, it had not been on pleasant terms. Things were different now. She lived by herself. Accepting him back into the house might signal that she wanted to get back together. She didn’t know if she was ready for that. “I don’t know, Cooper.” She looked to Carol for support, but since the woman had no idea what he was saying, she just shrugged her shoulders and raised her hands. Carol’s mouth opened in surprise at hearing those words. Her phone rang and she hurried to pick it up. She looked up, peering through the glass door to the office, seeing Cooper, looking sexier than a body had the right to, leaning against the opposite wall, cell phone to his ear.